In chapter five of his book, Bart Ehrman sketches out a basic narrative of the historical process which led to the production of the Gospels. I do not really disagree much with him about either the dating of the Gospels, or the Synoptic problem (i.e. the relationship of Matthew, Mark and Luke), but where I would have serious disagreements is with his analysis of the historical process that led to the production of the Gospels. In essence the difference is this—he imagines a long chain of oral tradition, involving the telling of these narratives by many people who were not eyewitnesses, which eventually led to the writing down of these traditions by others who were neither eyewitnesses nor in touch with eyewitnesses. By this means he seeks to explain what he sees as the many discrepancies in the Gospels. Besides the fact that this analysis is based on some enormous unproven assumptions, it in fact goes flatly against both the internal and external evidence we have about the matter. Let me illustrate, starting with Lk. 1.1-4. In Lk. 1.1-4, Luke tells us that he had observed, for a long time the “things which have happened amongst us” and more crucially he says that many had compiled a written account of things before he did. In addition, and most crucially he adds that he had consulted eyewitnesses and the original preachers of the Gospel message. On the prima facie showing of this preface to his Gospel what would it be reasonable to deduce about the gap between Luke and the original Gospel events? Was he writing at a time or a place so far removed from the original events that he could not consult those who were actually eyewitnesses of these things? Unless one wants to claim Luke is simply telling a lie, which few scholars would do, Luke is telling us that while he himself is not an eyewitness of the life of Jesus, nevertheless he knew and had consulted those who were, and used them as sources in his work. We must also conclude that he had written sources, which he calls ‘many’. I suspect he means Mark, perhaps a written collection of Jesus’ sayings (‘Q’), and perhaps Matthew as well, and there may have been other sources as well. Now it is the consensus of most scholars that Luke is the latest of the Synoptic writers, using Mark, and possibly knowing Matthew as well, but in any case later than Matthew. He probably wrote sometime in the 70s, or possibly even the 80s. This reminds us of an important point. There were still eyewitnesses around to be consulted until the very end of the first century, as Papias tells us, for he consulted a couple of them in the early second century. "And the presbyter said this. Mark having become the interpreter of Peter, wrote down accurately whatsoever he [i.e. Peter] remembered. It was not, however, in exact order that he related the sayings or deeds of Christ. For he [Mark] neither heard the Lord nor accompanied Him. But afterwards, as I said, he accompanied Peter, and formed his [Peter’s] instructions into chreiae, but with no intention of giving a complete narrative of the Lord's sayings. Wherefore Mark made no mistake in thus writing some things as he remembered them. For of one thing he took especial care, not to omit anything he had heard, and not to put anything fictitious into the statements." Now the presbyter in this statement is the man Papias calls John the elder. This is not John Zebedee, whom Papias had not met, but rather John of Patmos, who himself had been in touch with the earlier eyewitnesses, including the Beloved Disciple. If you want this statement by Papias properly unpacked at length, read Richard Bauckham’s excellent treatment of it in Jesus and the Eyewitnesses, and if you want a lengthy critique of Ehrman’s myth about long and weak chains of oral tradition see my critique of James Dunn’s Jesus Remembered, forthcoming in my What’s in a Word?. Here it must be sufficient to say that Mark was the interpreter and translator of Peter. What the Greek text of this passage suggests is that Peter often spoke in Aramaic, and Mark translated for him, and this included translating various stories about Jesus and his words and deeds into Greek. This explains a good deal about the Gospel of Mark (not least its various parenthetical translations of Aramaic words). Jesus spoke in Aramaic and so did Peter. Mark was more skilled in Greek than Peter. Now Papias tells us that Mark had no intention to give a full or completely chronological account of the life of Jesus, but simply to present some of the salient memoirs of Peter. He also tells us that Mark formed these narratives into chreiae, the rhetorical form for a persuasive short story that normally ended with a bang with either a notable saying of the hero, or a notable action of the hero. What this tradition tells us of course is that there is no long oral tradition gap between the events in the life of Jesus and Mark’s Gospel--- Peter himself is the missing link. And here it is worth adding that it is highly unlikely that the second century church, so enamoured with apostolic and eyewitness testimony, would have made up the notion that two of our earliest Gospels were written by non-apostles and non-eyewitnesses like Mark and Luke, who on the very showing of the NT itself were minor figures in early Christianity, not major ones. To this of course we could add the testimony about the Fourth Gospel from John 21 which says explicitly that the Beloved Disciple was an eyewitness of some of the events in Jesus’ life, that he wrote down his own memoirs, and that later the community collected them and composed what we call John’s Gospel. I would suggest the reason it is called that is because it was in fact John of Patmos who, having returned to Ephesus from exile, was the one who collected and edited the Beloved Disciple’s material. This is the same John who wrote Revelation and whom Papias had met. There are other points in Chapter Five that need to be challenged: 1) the notion that Paul tells us nothing about Jesus or his words and deeds. In fact every Pauline scholar I know would say this is false. Not only because he can recite the tradition passed down to him about the last supper (1 Cor., 11), or the death, burial and resurrection of Jesus (1 Cor 15), but also because with some regularity he draws on the teaching of Jesus (see 1 Cor. 7, and Rom. 12 and Gal. 6 for example). Furthermore, in his earliest letter, Galatians, Paul tells us he went to Jerusalem more than once and consulted the three pillars of the Jerusalem church James, John, and Peter (Gal. 1-2). You may be sure that the subject of the many conversations included Jesus and his words and deeds. 2) Amazingly, Bart Ehrman serves up warmed over Albert Schweitzer and his largely discredited theories about Jesus, from over a century ago, not only in Bart’s own book on Jesus as an apocalyptic prophet, but again here in this book. Schweizter to his credit was right that Jesus’ message and mindset was eschatological and prophetic, but he was quite wrong that Jesus thought the world was definitely ending in his lifetime and completely wrong that Jesus predicted the world would end within a generation. We have already dealt with this in a previous post (see e.g. Mk. 13.32). The fact that Ehrman ignores the numerous critiques of Schweitzer’s theories in most other recent detailed scholarly works on Jesus (see e.g. Wright’s Jesus and the Victory of God, or Flusser’s Jesus as Sage, or my Jesus the Sage, and Jesus the Seer, or John Meir’s massive multi-volumes on Jesus a Marginal Jew, or A.J. Levine’s A Misunderstood Jew and there are many more), is frankly just not responsible scholarship. 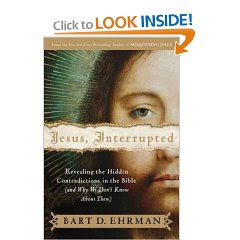 Of course the masses who read Ehrman’s book don’t realize that most Jesus scholars would disagree with him about this, because of course their works have not appeared in such popular form as this easy to read book. 3) on p. 174 we come to a statement which explains much, historians are unable to discuss miracles. He says this because he believes “there cannot be historical evidence for a miracle” (p. 175). This of course depends on what counts as evidence. I do not frankly see the evidence for ancient or modern miracles as any different than the evidence for other sorts of events. We should use the same criteria to evaluate all historical claims--- multiple attestation by reliable witnesses, and the like, which criteria Bart lists. A miracle, like any other historical event is a unique event. It does not differ from other historical events in this respect. This is of course why any historical event differs from a repeatable laboratory chemical experiment. Me personally, I am not merely open minded about this, I have been present when miracles of healing happened, that the doctors were unable to explain. This doesn’t mean it didn’t happen or a good historian should just ignore this kind of event in someone’s life, though he may be led to say ‘I don’t know how that happened, it doesn’t seem explicable in purely naturalistic terms’. But then there is no law that requires a good critical historian to be a naturalist in his assumptions about all life. None whatsoever. Let me leave you with a true story. Some time ago I was pastoring in Coleridge N.C. and had gone to Charlotte with my wife for a few days to visit my folks. One of our most stalwart church members, Bertha Albright, suddenly and unexpectedly became ill on a Saturday and was dead by the time we returned. This was in an age before cell phones, and when I arrived back in Coleridge my neighbor was frantic and asking me to come to his house. He was worried his mother had gone bonkers. You see, Mrs Whitehead had been Bertha Albright’s best friend, and about 4 or so that afternoon she had received a phone call from Bertha, which her son Roger had overheard. The phone rang, they talked for a while, and then Mrs. Whitehead hung up. She had been talking to Bertha. The problem is, that Bertha was already dead some hours, and so a phone call of that sort was, on a naturalistic set of assumptions, quite out of the question. I remember saying “I guess so, it was truly a long distance call.” But when I asked her what Bertha said, one of her remarks struck home “She asked if Ben would be back to preach on Sunday, and to tell him not to be discouraged but to keep giving those good sermons and doing the ministerial work.” I was a pastor of four churches, and it was difficult. And indeed I was discouraged, and wondered whether I belonged in the pastoral ministry. And that message was precisely the word of hope and help I needed on that weekend. Thanks Dr. BW3. I found the 3rd installment, and this latest one to be the most practical to my non-scholarly mind. I especially found teh discussion of the "Son of Man" to be a fine summary that help pull some of the pieces together for me on that issue. And of course the "miracle" encounter was refreshing to hear, and helped me remember when I've had "close encounters" in the past, and long for more in the future. Have your read The Jesus Legend: A Case for the Historical Reliability of the Synoptic Jesus Tradition by Paul Eddy and Greg Boyd? It is worth a read, especially regarding the use and reliability of oral tradition. These posts have been magnificent, Ben. Ive been following this blog on Ehrman. It seems like you agree with the majority of Ehrman's work but dont want to admit it. At least you are honest about things like we need to read the books of the bible the way they were intended. Like Genesis' creation story, it was a poem. I wish Fundamentalists knew this. You should talk more about this to them. They actually view it as a scientific account and try to disprove evolution because of that view. People like Ray Comfort and Kirk Cameron argue this point. It makes the average Christian appalled. Also, that story about the phone call from a dead lady....thats appalling to thinking Christians as well. It is thinking like this that drives people away from Churches even though they have been going their whole lives! "Modern historians do not need to be theologians to do their work, but when they step on holy ground, they ought to have the good sense to realize that they don’t know enough to rule God ought of the equation"
Amen! You shouldn't go take your neighbor's car, drive it around the town for a bit, and then complain to him about the handling. 'Has anyone ever assesed all the occurences in all of human history, and then weighed the probabilities' this one was worth qouting! Note- the catholic church has quite a rigourous standard for determining the 'historic' reality of catholic miracles, there are serious church tradtitons who do indeed affirm miraculous events. (1080) In keeping with our recent train of thought, lets talk a little on who wrote the new testament, and when did they write. During the rise of higher criticism in the universities [a type of learning that cast serious doubt on many of the truths of scripture, though some of the elements of higher learning were helpful; like the historic method, learning to study scripture thru a contextual lens] you had some who dated the gospels as being written by the end of the first century, even into the second! Today, no serious scholar would put them anywhere near the second century. And like I said the other day, those who attribute Paul’s writings to various unknown sources, they also can stick the older label on Paul's stuff. Do the scriptures themselves give us any hint at when they were written? Sure. They don’t tell us exactly, but some good hints. The gospels contain lots of historical records in them, who was ruling at the time. Certain census that were being taken, things like that. Of course this doesn’t mean the writers were writing at the exact time of the events, but it shows you their familiarity with them. Or if a gospel writer [I think its Luke] says ‘just as others compiled stuff about Jesus and all that he did, so I thought it good that I should do the same’. This would show you that the writer was not as close to the actual events as others. Or when Luke writes the book of Acts, he states that he had already written his gospel. Luke is pretty meticulous about historic stuff in Acts; he records the believers who were killed for the faith [Stephen, James- the disciple, not the Lords brother who was one of the main leaders at Jerusalem, who is also believed to be the author of the epistle]. The point being, if Luke ends Acts with Paul living in a rented room in Rome; plus he never mentions the martyrdom of Paul or Peter, this would indicate that Acts was written before their deaths. Nero killed them both in the 60’s, Nero died a couple of years before A.D. 70. It would seem rather odd for Luke to have left their martyrdoms out of the book! Peter and Paul are the two main characters in the book. If Luke is recording the martyrdoms of less known figures, you think he would have at least mentioned them. So this is kind of internal stuff you look at, and if Luke says he wrote his gospel earlier, Walla! This would give you an early date to his gospel, before Acts was written. Also, we have various common names; did John the apostle write all the ‘Johns’? The gospel, the 3 letters and Revelation. Most scholars have him writing the gospel and letters, some attribute Revelation to another John ‘John of Patmos’. They feel the Greek text in revelation is too different from the other writings, so they think another John wrote it. When I wrote my Hebrews commentary, I think I must be the only person left on the planet who still thinks Paul wrote it! I realize that this makes you look ‘illiterate’ in the scholarly world, but I have my reasons. If you believe in the real late dates to some of the books, you can cast too much doubt on the accuracy of the sources, if you go too early, you reject too much evidence. And in some cases, the dates are very important to the beliefs of the group. Preterists believe you can make a case for all the apocalyptic portions of scripture having been fulfilled in A.D. 70, they will bring up historical evidence of witnesses seeing chariots in the sky at the time of Titus overthrow of the city, signs and stuff that Jesus said would happen ‘at the end’ so to them ‘the end’ was A.D. 70. If revelation was written around A.D. 90, then it doesn’t fit. John [whether the apostle or the Patmos brother!] still shows the apocalyptic stuff as being in the future. So they make a case that revelation was written before A.D. 70, is it possible, sure. But we really don’t know. Plus, if you think it was written late, you place Domitian as the possible anti-christ figure, early- it’s Nero. So you see some brothers have put a lot of thought into this stuff. It’s good to be familiar with some of these basic things, especially when you have anti Christian activists using some of these things as sources for their activity. Christians should be able to debate coherently with them, if not they win their point. Most of all we have a tremendous amount of textual/historical data that backs up the record of Jesus and the New Testament. There is absolutely no other writing from antiquity with this kind of backing, the gospels and the new testament are historically trustworthy, whether or not we know for sure which John wrote revelation, or which James wrote James, really doesn’t matter. We KNOW which Jesus rose from the dead! I suspect there’s some deficiency in Ehrman’s probabilistic analysis of miracles. He contends that, because they violate laws of nature, their probability approaches zero. But the laws of nature are themselves not, or not all of them, probabilistic. There are physical impossibilities, such as exceeding the speed of light or F = mv or lights not bending in a gravitational field. So then the probability of event occurring that’s inconsistent with these laws or the laws that underlie them is zero--they are impossibilities. So also is the event “ceasing to be dead.” If such an event seemed to occur, we could only conclude that we’d had been mistaken in believing the person to have died. But Witherington simply refuses to acknowledge that miracles are any less probable than are events consistent with the laws of nature. He blithely remarks “We should use the same criteria to evaluate all historical claims--- multiple attestation by reliable witnesses, and the like, which criteria Bart lists. A miracle, like any other historical event is a unique event.“ But by definition a miracle is unlike other historical events in that it contravenes the laws of nature. Hence, since rarely (Ehrman) or never (me) are the laws of nature contravened, it is an improbable event. Attestations, etc. have to be discounted heavily because of the antecedent improbability of a miracle, or disregarded because of its impossibility. We must then set about finding an explanation that is consistent with the laws of nature--and hence more probable than the weight of the evidence of attestations, etc. would suggest. Any believer contends that he or she has applied the criteria of multiple attestations, etc. * Muslims--well, most Muslims--for instance, are as certain of the prophet’s flight to Jerusalem as are Christians of the resurrection--or resurrections, if one throws in Jairus’s daughter, the son of the widow at Nain, and Lazarus. But the fact is, death is a condition from which one doesn’t recover, and, as physiologists can explain, one cannot recover, involving as it does a number of processes that are irreversible. Similarly, human beings can’t fly. Given the choice between trying to explain how some of us came to believe someone flew or rose from the dead, and how some of us flew or rose from the dead, we can get far by choosing the former and nowhere by choosing the latter. All of this was argued with piercing brilliance by David Hume centuries ago. (See www.timeshighereducation.co.uk/story.asp?storycode=405647) As Hume said well, “No testimony is sufficient to establish a miracle, unless the testimony be of such a kind, that its falsehood would be more miraculous, than the fact, which it endeavours to establish.” Hume’s leavened skepticism will take us much closer to the truth than will an unbounded credulity that allows of dead women’s placing telephone calls. *Or they may instead simply rely on faithful revelation. I am REALLY enjoying these posts. Last night I made a presentation on Wolfhart Pannenberg for my classmates @ houghton and this post connects well with what I've been thinking about lately. We're up to 18,000 words and no end in sight. I'm projecting it will swallow up Bart's book itself in size. And that's a good thing. I'm saving the posts because of the excellent points therein. This subject is so incredibly vital for those of us who have the Jesus of the gospels, of history, at the center of our lives. Reading these posts inspires me to dig further. I am wondering what your basis is to say this- "Also, that story about the phone call from a dead lady....that's appalling to thinking Christians as well. It is thinking like this that drives people away from Churches even though they have been going their whole lives!" I am not a Fundamentalist, and have no problem with either Biological Common Decent or the book of Genesis, interpreted as its genre was meant to be, since I fancy myself a "thinking Christian." However, I don't see how a "thinking Christian" would be scandalized by a supernatural story that came from a credible source. "All of this was argued with piercing brilliance by David Hume centuries ago." yet again your blog continues to be a source of intellectual and spiritual enlightenment. Bless you. Dr. Witherington, thank you for your analysis of Ehrman's work. Your diligence and persistence are things I look up to and keep in mind when I do my own biblical/theological research. James - I am not sure why you seem so confident that the only thing necessary to refute Witherington's claims is a reiteration of David Hume's skepticism towards miracles - have you even read major philosophical works since Hume that deal with him? Are you familiar with much of the writing that has taken place in philosophy of religion over, say, the past sixty years? Your overly confident and pompous rehashing of Hume's long-discredited and undue skepticism towards the supernatural accomplishes nothing by way of constructive argument or dialogue; it merely demonstrates that you suffer from the same malady from which many accuse evangelical Christians of suffering: arrogantly ruling out an entire realm of evidence because of a priori assumptions you do not really scrutinize. It's hard to know which absurity to begin with first in this post. I'm no scholar and wont pretend to be but this post contains so much nonsense that I would like to respond to some of it. First of all,while I'm not trained in Greek, the numerous translations I have of the New Testament never indicate that the anonymous author of "Lukes" gospel claims to have actually consulted any eyewitnesses himself,nor does he give the name of a single person who was supposedly an eyewitness to Jesus. You ask would Luke tell a lie? Well, first of all, the writer of this gospel never claims to be Luke any more than he claims to be Billy Bob or Sigfreid and Roy. However,are you implying that Christians don't lie? The New Testament contains several epistles that are believed by most scholars to be forgeries. That's kind of like a lie,isn't it? Were the founders of the Morman Church all liars? Were the scribes who made numerous changes to the text liars? If the wirter of the Gospel of Mark was a companion of Peter can anyone give a logical reason as to why he never once indicates this? What rational reason is there for not indicating a connection to his source even if the author chose to remain anonymous? "Mark" is relaying critical testimony but doesn't feel the need to share the incredible source behind it? Since Mark himself was a minor player in early Christianity, why not indicate that the testimony he is writing has the "authority" of an important diciple like Peter? Regarding the belief that the apostle Paul says nothing about Jesus' words and deeds Mr.Witherington says-"every Pauline scholar I know would say this if false".Well, Mr. Witherington, that probably says more about your circle of friends than it does about the facts. Regarding the "tradition" of the Lords Supper, Paul states clearly that he received this "from the Lord",through revelation,not from any man. He says the same thing about the "gospel" itself in Gal 1:11-12. These are odd statements from a man who supposedly interacts with "eyewitnesses" of Jesus. Your assertion that Paul draws on the teachings of Jesus is simply laughable. Paul never once names Jesus as the source of any teaching in your examples of Rom. 12 and Gal 6. It is striking that he does not because it would be the naural thing for him to do if he were aware that these teachings came from the mouth of his Lord. Regarding 1 Cor.7:10-11, you should turn to Malachi 2:14-16 to see the source of this teaching. Paul frequently cites the Hebrew scriptures to support a point he is trying to make but he never once cites Jesus in any way other than by revelation to Paul himself. As to Pauls visit with the Jerusalem pillars Mr.Witherington says-"you may be sure that the subject of many conversations included Jesus and his words and deeds". And yet,Mr. Witherington, you are unable to cite a single instance where Paul directly puts any of these words and deeds into the mouth of Jesus. And Jesus' words about the end times being near are consistant with other Jewish leaders/teachers who lived during this time, including Paul,John the Baptist and numerous other Jewish writings from the time. I think C.S. Lewis said it best-"the apocalyptic beliefs of the first Christians have proven to be false. It is clear fron the New Testament that they all expected the second coming in their own lifetime.And,worse still,they had a reason,and one which you will find embarrassing.Their Master had told them so.He shared,and indeed created,their delusion.And He was wrong." I find it interesting that in another post you lament the death of "hard news", yet, in this post you argue FOR a religiously biased approach to the bible. You suggest that ONLY insiders (people who hold religious superstitions) should be in the business of biblical study. Really? Ehrman represent the equivalent of "hard news" in biblical studies. On the other hand, your analysis has become more like a fluff piece. Your recount of what you suggest was a "miracle" simple shows how easy it is for people to form mythical explanations around natural events. I'm unclear what you were trying to prove by adding that account and interpretation. You have some great points to make and I've enjoyed your blog for years, but your plea for a superstitious approach to study undermines everything else you said. It makes the reader question your ability to approach the text with reason and sanity. Your comments are mostly about me, whom you seem to know very well indeed, and not about miracles and the arguments that surround them--except for a gesture in the direction of supposed decisive counter-arguments. I'm not a very interesting subject. What the counter-arguments are is left unsaid. The question of interest, I'd think, for starters, is whether what Ehrman says about miracles at pages 171-179 holds water nor not. Is it true that "more or less by definition, historians cannot establish that miracles have ever probably happened." Or we might ask whether our certitude that dead people can't talk is great enough to justify rejecting a report that a dead person has talked. The trouble with ad hominem is that it's irrelevant and uninteresting. I'm said to have left out "an entire realm of evidence." And apparently this evidence is potent stuff-=can prove extraordinary things. I'd sure like to know where this trove of evidence is to be found and what it holds. So there is “entire realm of evidence” I don’t scrutinize. Where is this realm? What is that is to found there? Take our certitude that dead people can’t talk. Is it sufficient to justify skepticism about reports that they have talked? How high a barrier to belief does our knowledge of the nature of death erect? If we lower the barriers, what other reports, of miracles whose occurrence we don’t accept, must then be admitted? More to the point, what of Ehrman’s contention that “more or less by definition, historians cannot establish that miracles have ever probably happened”? Of his contention that “there can be no historical evidence for the resurrection because of the nature of historical evidence”? Aren’t miracles, as he says, “the least likely occurrence”? More or less by definition? (If they were to be expected,they wouldn’t qualify as miracles, would they?) Can historians establish that the less probable in fact occurred? Is it not true that “there are lots of explanations for what happened to Jesus [grave robbers emptying the tomb, the empty tomb story post-Pauline] that are more probable than the explanation that he was raised from the dead”? Where is this realm of evidence that so potent that it can render it probable that the dead rise and talk? Witherington makes an important assertion--that “inexplicable things do happen in history, things not explicable by modern science.” He also says that because there are millions of reports of miracles having occurred, “it’s quite impossible to say that miracles are the least probable of historical occurrences”--because we haven’t assessed all these occurrences (reports) and weighed their probability. So we get to the nub of the disagreement between Witherington and Ehrman. Ehrman says that “inexplicable things”--things contrary to the laws of nature--are unlikely to occur. Therefore reports of their occurrence can be discounted--ruled improbable. Witherington says things contrary to the laws of nature may well happen all the time. We know this because there are so many reports of their occurrence and cannot investigate even a small portion of them. For Ehrman, science is great winnower of reports of miracles, enabling us to conclude they are improbable. For Witherington, science can’t winnow, and the reports must be at least provisionally credited, not burdened with undue skepticism. At any* time, God may intervene and accelerate or transcend the laws of nature--many of which we may well not know anyway. When he does so intervene, the reported events will in fact have occurred, no matter the laws of nature. The disagreement comes down to winnowing. Witherington says reports of miracles are all of them worthy of investigation. Ehrman says we can presume miracles are improbable occurrences and therefore shouldn’t credit them (absent, possibly, reinforcements from the faith front--that is, on grounds than of evidence as understood by the historian qua historian). Need the winnowing mechanism need be scientific? Take for instance the notion that dead people don’t rise. True, an understanding of physiology may reinforce this belief and enable us to understand WHY it is they don’t. But the brute fact THAT they don’t is fundamental to human life, and presupposed by the experience of grief and loss. However, it’s also true that survivors commonly have experiences that seem to them to be explicable only by the return of the dead to something like life. Before there was physiology, there was skepticism. Many ancients scoffed at reports of visits by the dead. But first of all, to showing the irreversibility of death, physiology is a great aid. It raises it from a brute fact to an occurrence contrary to the laws of nature. Then, beyond physiology, there is psychology--the systematic investigation of how as children we learn to ascribe purpose and animation, and of how difficulty it is for even those who say they believe that when you’re dead you’re dead to consistently appreciate the implications of annihilation--so they take it they will have post-mortem experiences. Science aids in coming to understand why credulity is the default mode of the human mind--why there are so many reports of miracles and why they are so widely believed. So science is not the only winnower, but it is a great one. It renders it highly improbable that anyone would rise from the dead. I would say impossible. But at any rate, it provides compelling reasons why reports of resurrection must be heavily discounted by the physiologist, by the historian, by anyone who knows the first thing about how the world works. I would have thought, too, that everyone curious about the life of Jesus finds it regrettable that, in the surviving letters, Paul so seldom had occasion to report to us any words or deeds of Jesus (the Last Supper being perhaps the most important and invaluable exception). I would suggest you read carefully what Ehrman says about Paul on pp. 144-45 and 151, where he says Paul knows no Gospels, and then assumes that Paul also knows almost no Gospel traditions, or else Bart would have analyzed them under the heading oral traditions. He completely ignores the traditions in various places in Paul where he uses Jesus' sayings to make a point. James I would also gently ask you-- whence comes your certitude that dead people cannot communicate with us from beyond the grave, especially since there are many credible accounts to the contrary (e.g. the famous case of C.S.Lewis and J.B. Phillips)? I am afraid that you are certain of things which it is quite impossible to be certain about, not least because your knowledge of such things cannot be exhaustive. On the reliability of Papias, see Bauckham's Jesus and the Eyewitnesses. There is no good historical reason to discredit the report of Papias. I have no reason to doubt that Phillips believed that he was visited by the Lewis’ spirit, twice. One good historical reason not to rely on Papias might be Eusebius’s view that he wasn’t very bright and was highly credulous. As to Peter’s whispering in Mark’s ear, Papias himself says that he talked not to Peter but to an elder who had heard what Peter said. This may not be as many chances to garble the message as at the average birthday party game of telephone, but it’s getting there. Knowledge less than exhaustive is what we all have. But some things we know with more certainty than others. Papias was a millenialist, just like John of Patmos when he wrote Revelation. Eusebius's comments about Papias must be taken in context and in this case the context is that Eusebius despised milleninarian thinking. So Mark recorded the life of Jesus as recollected by Peter accordind to Christian apologist Papias.... Odd that Mark didn't include such noteworthy material as Jesus' virgin birth and many I AM statements. You would have thought Peter would mention those things. You are totally forgetting that these Gospels were originally written on papyrus which could contain only so much content. Mark chose to tell the story of the ministry of Jesus, which quite easily could take up several papyri. The virginal conception is not germane to his story telling any more than the I am sayings are, since he is presenting Jesus as an apocalyptic and messianic seer who is revealed to be the Son of God in disclosure moments at the cross, at the Transfigfuration, at the baptism. Mark chose the portions of the story that fit this sort of story telling and his interest in things eschatological. Jesus was a diverse and complex enough person to have several biographies written about him and not exhaust the relevant historical material. One wonders why Mark would want to portray Jesus as a 'messianic seer' who revealed himself rarely in 'disclosure moments' as the Son of God if he knew full well that Jesus was a pre-existing divine being who couldn't stop talking about himself and his heavenly origins (see John's gospel). The most obvious and most simple explanation requiring the fewest amount of presuppositions is that Mark wasn't an eyewitness or buddy of eyewitnesses. Mark simply wrote down the oral traditions that he heard which had been in circulation for decades. No one knows how much of that oral tradition was reworked by Mark. Later Mark's gospel circulated and became embellished by yet more people (Mat,Luke) neither of which were eyewitnesses or knew any either. Yet later John's community completely writes a new version to conform to their own communities beliefs and traditions on the matter. Papias and others church leaders fighting a power struggle took the books they liked and added authoritative names to them to give them credibility. Just as other groups had thei own books and many books were created in the names of the disciples. I am not in favor of preferring historical obscurantism, to the close analysis of what sources we do have. The fact of the matter is, we have no evidence whatsoever that Mark's Gospel is a product of late reformulations of a long chain of oral tradition. None. Not a single tradition attests to such a process. Nor do we have any historical evidence whatsoever that Papias was engaged in a 'power' struggle with anyone over these Gospels. He is simply reporting what he heard from a couple eyewitnesses-- that's it. So you two choices-- favoring a hypothesis for which there is no external historical support, or choosing to deal with both the internal and external evidence as we have it. The latter is the proper choice if one wants to actual draw conclusions based on evidence rather than mere assumptions or suppositions about oral tradition and the like. Papias and others church leaders fighting a power struggle took the books they liked and added authoritative names to them to give them credibility.What actual source material do you base that claim on? Can you cite letters from the period? What actual evidence from contemporary documents can you cite to the effect that Mark was just writing down what had been circulating for decades? Well the evidence is an anonymous work full of tall tales the does not correspond to the way the world works as we know it. It does correspond to ancient mythology and folklore and so should be approached as such. Mark is the one making claims there is no evidence for and that draw suspicion based on what we know. The romans would not have let a criminal guilty of insurection/revolt go to appease the jews and Pilate would not have been sympathetic to someone causing disturbances during the passover and claiming to be a King. The romans would not have allowed Jesus' body to be taken down by friends and family for an 'honorable burial' either. Mark clearly bases his crucifixion story on borrowing from Psa 22. His story is mythological/fictional through and through. Such a story needs overwhelming evidence to overcome its improbability. Because no overwhelming or even underwhelming evidence exists to corroborate Mark's story a natural explanation is the most probable. Its time for you to come clean Hail. I clicked on your tag and it led to no identification of who you are. The prerequisite for commenting on this blog has always been that you have to have the courage of your convictions. So--- fess up-- who are you? As I suspected. Hail can't cite any actual contemporary evidence to substantiate his claim that Mark was the recording of an already existing "oral tradition". In the end he is forced to make speculative guesses based on a superficial reading of an English translation. You will have to be more specific about what you would like to know about me. I will say that I saw a link to your Ehrman critique on debunkingchristianity which is how i came to your blog. You are demanding contemporary evidence indicating Mark was passing along oral traditions or making things up. But you have no contemporary evidence that Mark was an eyewitness or attempting to record actual history. We are both speculating here. The burden of proof is obviously on the Christians who are making the wild, fanciful claims about a miracle working son of god being raised from the dead. You simply do not have adequate evidence to overcome the improbability of your claims. There are far too many natural explanations that are more plausible. Nice to know your real name. First of all Papias's report is from someone who did know Peter and Mark--- John the elder, so its only second hand, and I am sure you have trusted plenty of second hand info in your life, as have we all. Your chief problem seems to be with miracles, which are still busily happening if you look in the right places and keep your eyes open-- too many healing miracles to even count in my own lifetime. So, I am afraid you will have to do better than the old anti-supernatural bias approach. You are demanding contemporary evidence indicating Mark was passing along oral traditions or making things up.No. I asked you to substantiate your supposition that Mark is based on an oral tradition. I don't really care whether you accept or reject the claims of Christianity. I would bet money that if this year a scroll was discovered that turned out to be the Q source, and scientifically dated to circa 40AD, and showed the same Semitisms of construction, syntax etc as the Dead Sea Scrolls, you would be no more likely to accept the claims of Christianity. You could just claim all the disciples deluded themselves. The issue here is your generalization about the NT documents. You just don't have material reason to back it up. Anyone familiar with Ben's scholarship and the work of his colleagues would know there is very good reason to believe the Gospels were based on the testimony of a small band of the eyewitnesses and their disciples. You can still accept or reject the larger claims of the faith. Fine by me. PS: I assume from your pseudonym you're a RE Howard fan. Me too.